Student Success: We've passed the mid-way point: Week 5 is here! We've passed the mid-way point: Week 5 is here! 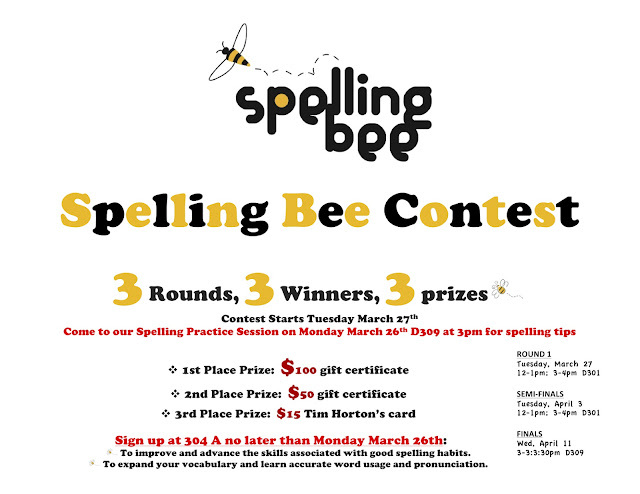 C'mon out to get spelling tips and strategies for pronunciation and spelling. Round 2 (The Semi-Finals) will be held this week on Tuesday April 3 and the Grand Finale will be on Wednesday April 11th! See you there and Good Luck. C'mon out to participate or just cheer on your peers!